My dad wasn't a rocket scientist, but he came close. He was a nuclear physicist with a near photographic memory. When the Alzheimer's disease kicked in, it made him furious. The son of a career master sergeant in the Army Air Corps/Air Force, Bob Young got his bachelor's degree and a master's at Baylor University, another master's and a PhD at Rice University and in between, spent two years in the Air Force to fulfill his ROTC commitment. He and Mama got married between Baylor and the Air Force, and over the next several decades they raised four children. I am the oldest. He taught at Houston Baptist when it first opened and eventually worked for IBM, helping them do tests for Dow Chemical to see how some of their chemicals would react in a nuclear explosion. Daddy could focus on what he was doing to the exclusion of everything else, which made him a great scientist in the absent-minded professor mode. At dinner time, when Mama parceled out the chores, one of us would always be assigned to call him and remind him it was time to come home and eat. More than once when we went to pick him up at work, he would open his briefcase to put his things away and say, "Hmm. No wonder I'm hungry. I forgot to eat my lunch today." In those days, it was funny. Both of my paternal grandparents died of Alzheimer's, so Daddy knew he had a good chance of getting the disease. My parents lived in Austin when we first started noticing Daddy having trouble with his driving and finding his way around. They decided to move to the small town where my youngest sister lived and God's providence found them a house right next door to hers. The move brought their struggles into focus. Daddy went out for a walk along the river and got lost. For the first time ever, he couldn't manage to get their taxes done and I took that job over. (I mailed everything to my CPA brother-in-law.) Daddy had notes to himself stacked up beside the mouse pad of his ancient computer, reminding him how to get in to his e-mail. He had created methods for coping. But he wasn't. My gentle, intellectual father had zombies eating his brain. They're invisible, insatiable and a shotgun is absolutely no use against them. There is virtually nothing that science can do for this disease. Physically, he was healthy as a horse, but mentally... Alzheimer's changed his personality. He knew he was forgetting things and it made him angry. Angry enough to strike out, and the closest target to hand was Mama. She would hide her bruises from us, understanding that he didn't mean it. But it's too hot in Texas for long sleeves in July, and eventually we saw them. We understood it too, but it was also our job to protect her. For a while, they lived in separate bedrooms, but eventually we had to move him out of the house. For about a year and a half, he lived at a nursing home in their small town where Mama could come visit him. But when he started pushing the nursing home attendants around, we had to find somewhere else to take him. I called The Cottages Assisted Living in League City, and once again, God had his hand in things. They had room for one male patient. We moved him to Galveston County two days later, in October of 2012. When we went to pack him up for the move, he kept reminding us how to find his room and which way "out" was. He was ready to go. But once again, the move created a turning point. Memory loss is not the whole of this disease. The zombies start by eating memory and personality, but they end by destroying everything. Alzheimer's is a terminal disease. Eventually, physical capabilities are taken as well. 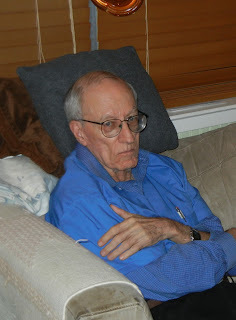 The people at The Cottages took wonderful care of Daddy, but he quickly began to have trouble walking and seeing. They got him a walker for his balance, but he either forgot to use it or he picked it up and carried it around. We took him to the eye doctor about his cataracts, but the doctor said he could apparently see more than he could understand what he was seeing. We decided cataract surgery would just hurt him. He forgot our names, but he always seemed to recognize that whoever we were, we belonged with him. That December, one of the regular entertainment ladies was doing her Christmas carol-patriotic song program and as I walked into the living room of The Cottages with Daddy she was singing "The Star Spangled Banner." All of a sudden, Daddy's thin tenor was belting out "And the rocket's red glare." He couldn't remember all the words, but he could sing the tune. We sat down and sang all the Christmas carols he knew. That was the last semi-lucid day he had. His words became word hash. He felt his way around the halls because he couldn't tell what he was seeing. And I began to pray that the Lord would bring him home. Daddy was stubborn. He wasn't going to go one second earlier than he had to and while his brain was dissolving, his heart, lungs and all the other parts were still going strong. He began to fall. We were called to the hospital a number of times because he had fallen. It was a struggle to keep him in the hospital bed and to keep him from pulling off all his attachments. He had to have a sitter when we weren't there, to keep him in place. But he always got to go back "home." Then he fell hard enough to fracture his skull. The only treatment for that was to drill holes and suction out the air and fluid that got in. That was just too much. Not only did he not know us, he didn't even know the world around him. It was time to call in hospice. Mother came down to stay with us and we drove up to sit with him every day. Darned if he didn't hang in almost two more weeks. He died at the end of February 2013, two years after he first moved into the nursing home. Alzheimer's disease and other forms of dementia strike different victims in different ways. My mother has also been diagnosed with it, but hers has progressed much more slowly and she forgets that she can't remember. It doesn't make her so angry. But it's still a terminal disease. One that can take years to claim its victims. And the victims include the family members. It never did bother me much when Daddy didn't remember things, like when he remembered our cousin Paul but not my brother Steve. It wasn't him, it was the zombies. I didn't expect anything from him. He didn't even have to know me, because by this time, it wasn't about him loving me. He'd loved me all my life. I knew he loved me, even if he couldn't remember it. It was my turn to love him and take care of him. I'm glad I had the opportunity. That's how you get through something like this. You can't expect anything from someone with dementia. You can't blame yourself for things that happen. You can't blame them. All you can do is love them, and be grateful for the opportunity. 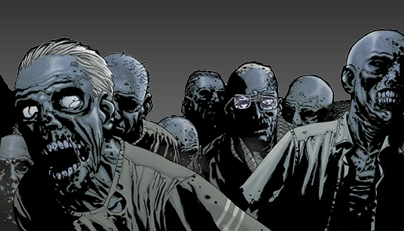 And if you need somebody to blame, blame the zombies. It is still so, so hard to deal with. The first time my grandmother didn't know me, I remember feeling erased. Like I didn't exist anymore if my grandmother didn't have a mental map that included me. Completely irrational, but it was still a hard day. The plus side, I suppose, is that she felt loved and happy. Thank you. That was so well said, it helps to have someone articulate the pain and confusion of loving an Alzheimer's patient. So many people treat Alzheimer's Disease as if it's not a "real" disease, just an inconvenient old person's problem with memory, when in fact it is a deadly, incurable disease. Did you know that you can create short urls with AdFly and make money from every visitor to your short urls.